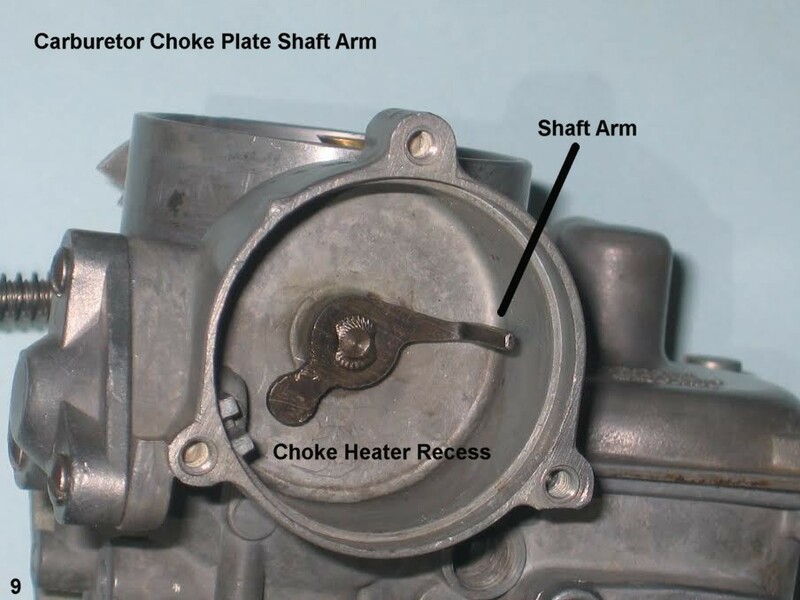 In the 1970s, when I first began dealing with ’67 Beetles, carburetor work was complicated by the antiquated Choke Heater Element’s design. Yes—it had worked for years. But, no—it was a pain. Then came the one-piece Choke Heater Element. To use an old slogan, O—what a relief it was! By contrast, the earlier version was a multi-piece part. When installing, after a Carburetor cleaning, those “slippery” pieces had to be juggled and kept in place while installing the Heater Element. Back then, my hands were, well, very handy. I usually had no problem with either disassembly or reassembly of anything. But, as I said, some of the parts of the Heater Element were “slippery”. Let’s take a look at the assembled early Heater Element. That doesn’t look so bad, does it? But, now, let’s examine the components. 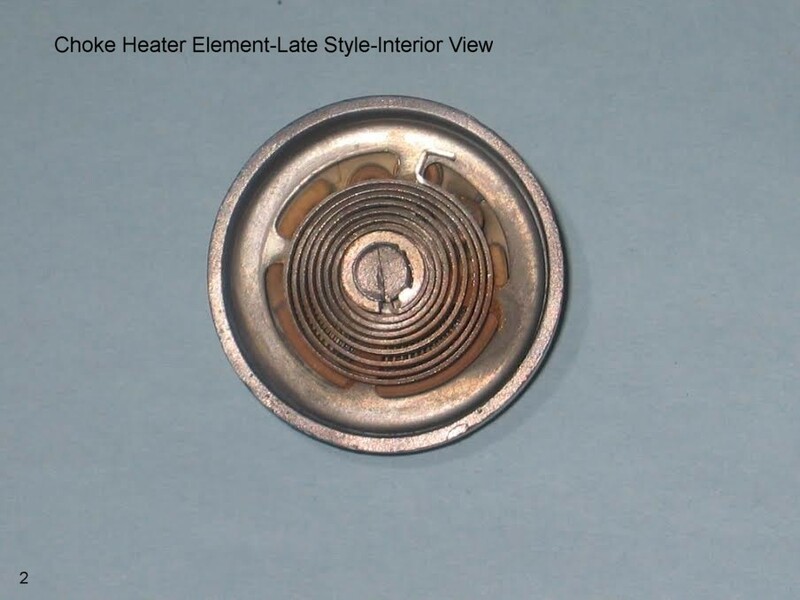 The Body of the Heater Element is a ceramic disc. Although the improved version also incorporates a ceramic interior body, its ceramic disc is completely encased. Unlike the earlier version. With the Ceramic Body so exposed, it was prone to chipping. Drop it and you were done! I actually used some of these Elements which had broken—I fitted together the pieces and used the part the best I could. In fact, for this article, I had to sort my parts in order to find one which wasn’t damaged in some manner. The Ceramic Disc is important in two major respects—1. Ceramic doesn’t conduct electricity, and 2. 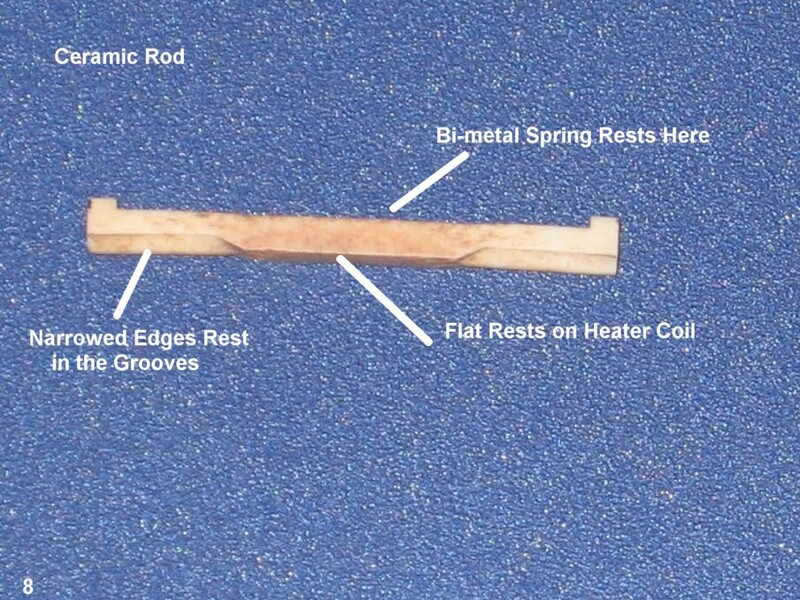 Ceramic holds heat—a relevant factor for this Heater Element. In order to function, the Element must have both a Positive Contact and a Negative Contact. 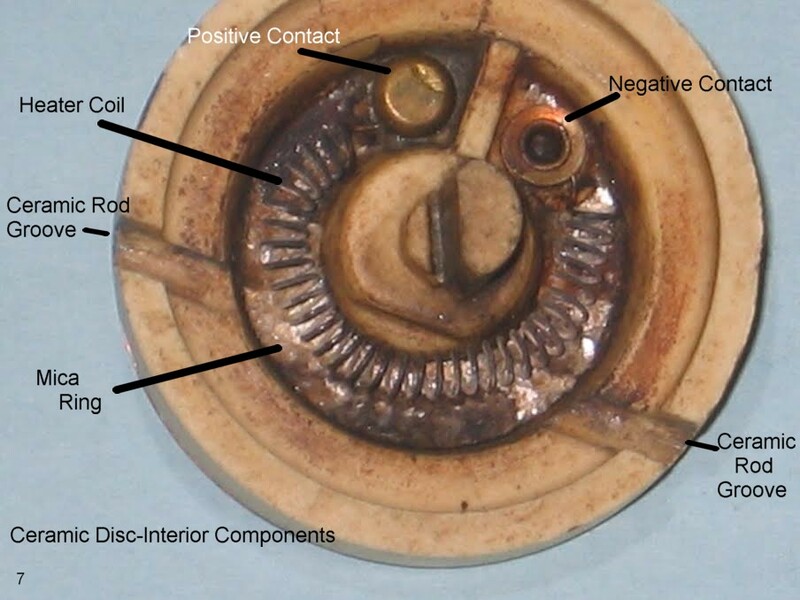 The Positive Contact is the one with the Electrical Connector. 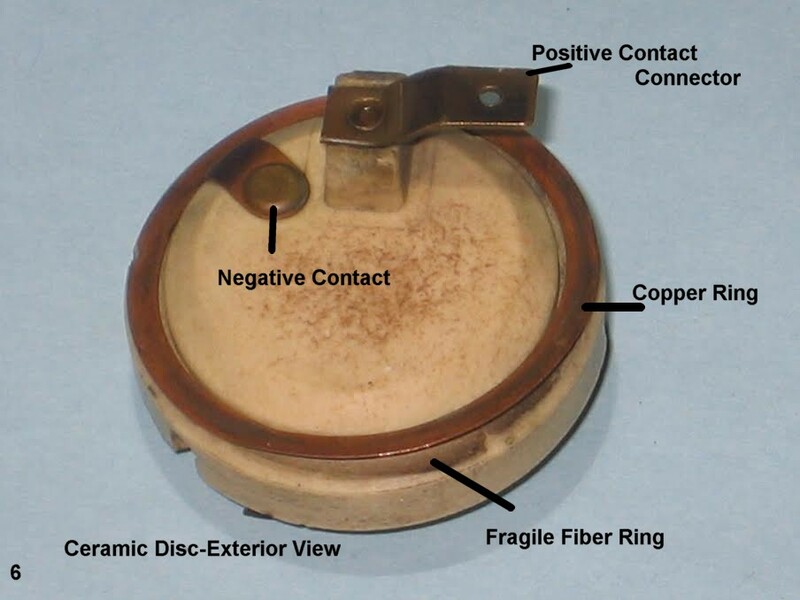 This Connector is fastened to the Ceramic Disc by a brass rivet which fits into a hole through the Disc. The Negative Contact also is fastened to the Disc using a rivet. The Negative Contact consists of a Copper Ring with a Tab. The Tab is the point of the riveting fastener. Beneath the Copper Ring is a very fragile non-electrical-conducting “Gasket”. The Gasket is held in place by the Copper Ring. So far, this is what we see on the outside of the Ceramic Disc. Turning the Disc over and looking into its recess, we see that there is a flat, thin, fragile Mica partial Ring. This Ring serves to more evenly disperse heat generated by the Heating Coil where the Heating Coil lies against the Ceramic Disc. The Heating Coil is attached at one end to the Positive Contact Rivet and at the other end, to the Negative Contact Rivet. Notice that the Ceramic Disc has a slot at either side. The slots make way for a slender Ceramic Rod which fits the slots perfectly—filling the slots. This Rod is complex—it must fill the slots but it also must leave room for the Bi-Metal Spring which will rest upon it. The flat bottom-side of the Rod rests upon the Heating Coil, keeping the Coil from touching the Bi-Metal Spring. The top-side of the Rod is flat so that the Bi-Metal Spring will flex easily upon it. 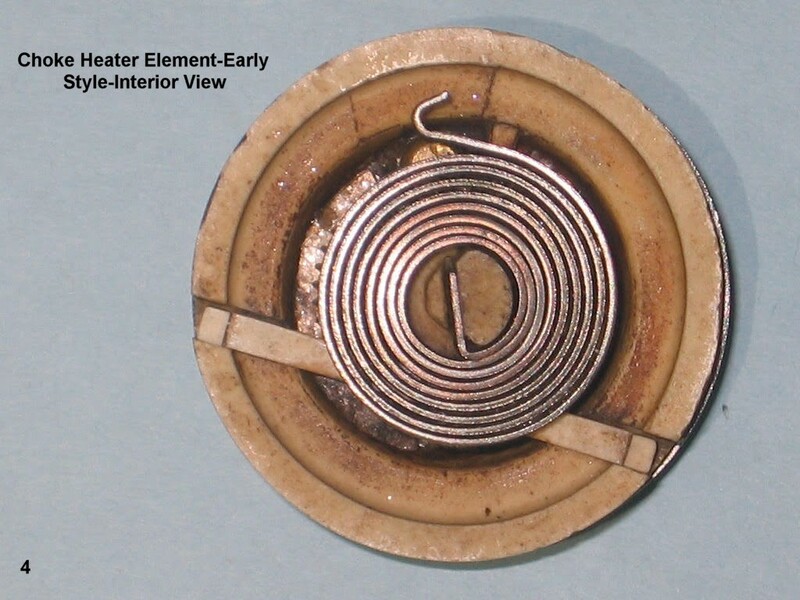 The Ceramic Rod also assists in the heating of the Bi-Metal Spring by conducting heat to the Spring. Next, comes the Bi-Metal Spring. The Choke Plate Shaft extends into the Choke Heater Recess. The Arm on the end of the Choke Plate Shaft engages a Hook on the Bi-Metal Spring. 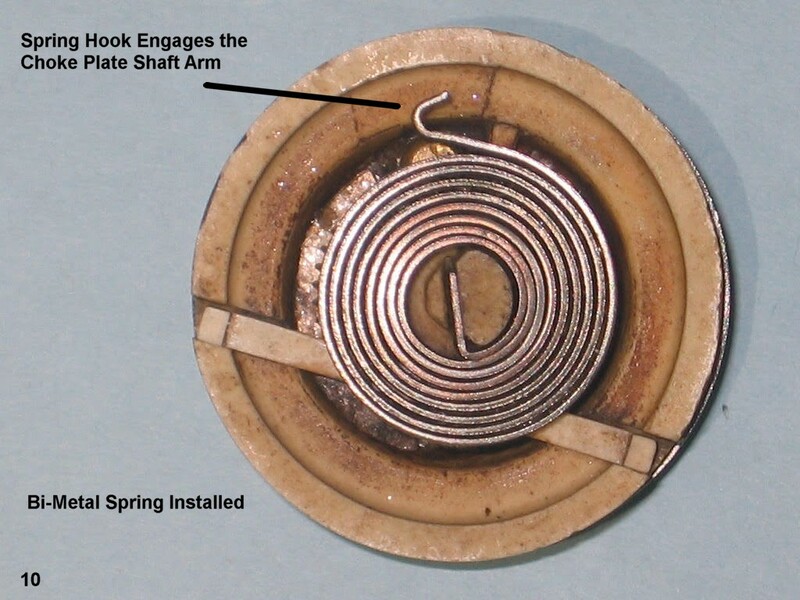 As the Heating Coil warms, heat is transferred to the Bi-Metal Spring. The Spring begins to expand—uncoiling and relaxing its grip upon the Choke Plate Arm—allowing the Choke Plate to open. 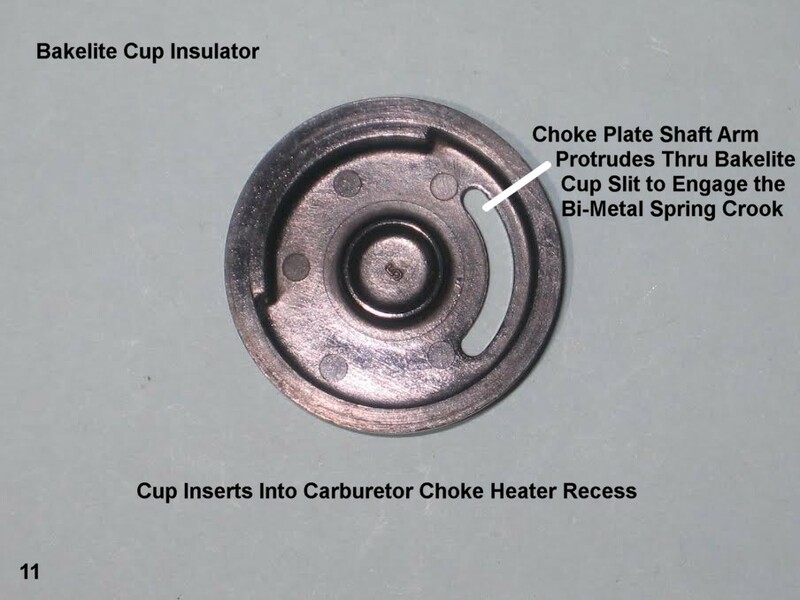 But, we can’t over-look the Bakelite Cup which fits inside the Carburetor’s Heater Element Recess. This Cup acts as a heat barrier so that the Carburetor Body doesn’t get hot. All of the heat must be used to move the Choke Plate Shaft Arm. 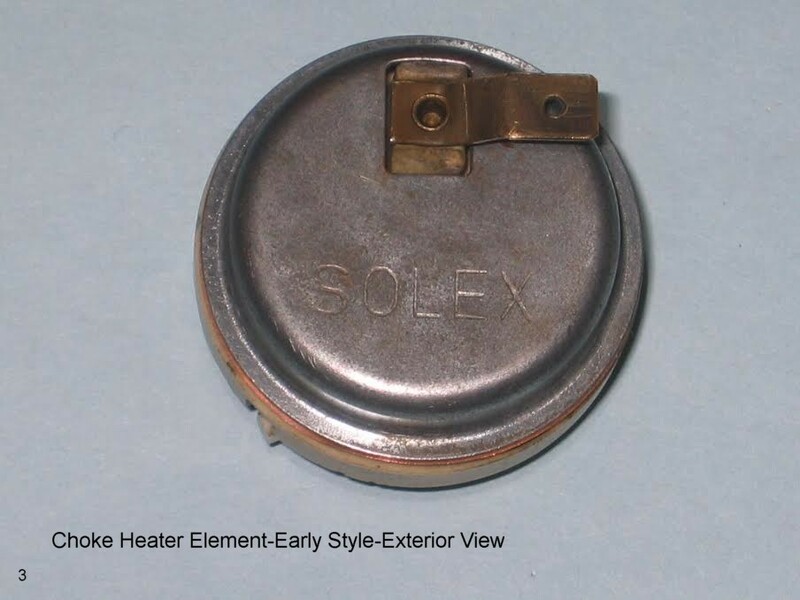 Finally, there is a Metal Cap which covers the outside of the Heater Element (refer to photo #3 above). 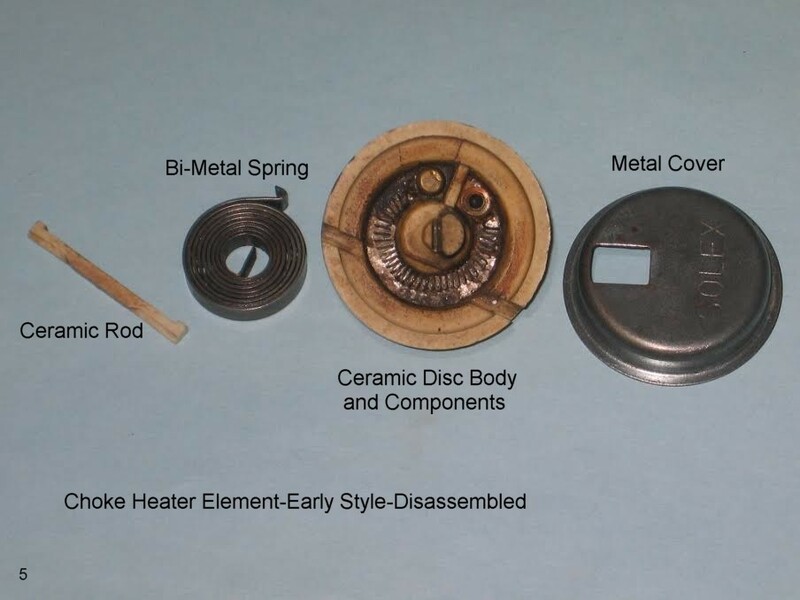 The Metal Cap rests upon the Copper Ring, thus becoming the grounding element to complete the Electrical Circuit when it is fastened to the Carburetor Body by the Securing Ring. 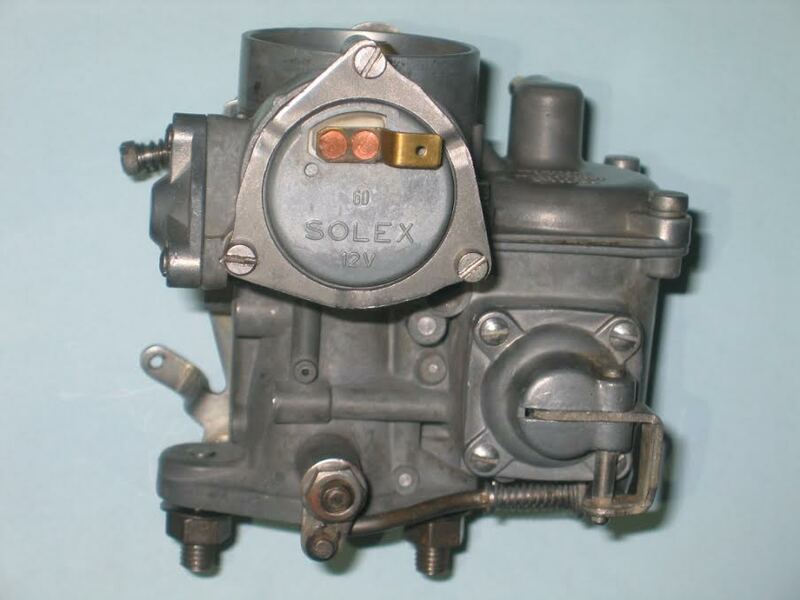 The Carburetor grounds to the Manifold, which grounds to the Engine, which grounds to the Body of the Beetle, which grounds to the Negative Pole of the Battery. The Circuit is complete. Today, we omit those early multi-piece Heater Elements and deal only with the simplified Choke Heater Element. Which operates as did the old part but more efficiently. 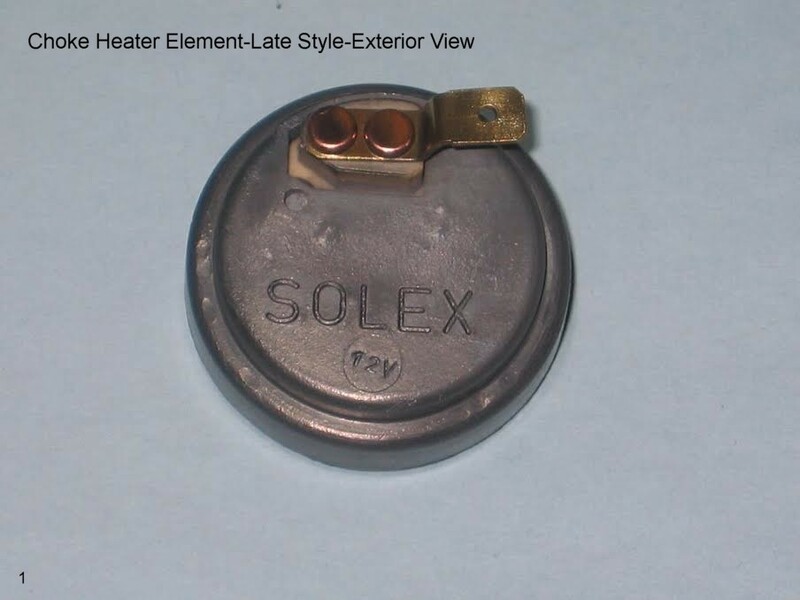 Here are long-overdue cheers for the Solex Engineers who refined the Heater Element! Jay, what a great article. An explanation of how all of the components work. Those engineers were the greatest back in the day. Hello Jay. You never cease to amaze me (and all the other ’67 VW owners) with one outstanding article after another. Hope you, Neva, and all the extended Salsar family are doing fine. Once again, thank you Jay for the time, insight and the passing on of knowledge you provide us 67′ owners. Great job. Another great article. I will always appreciate Jay for taking the time to educate me on carburetors. Thanks!